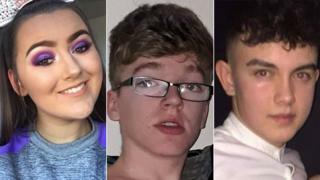 Three boys have died after the two reports of a crush at a St Patrick’s Day party at a inn in Cookstown, County Tyrone. Lauren Bullock, 17, Morgan Barnard, 17, and 16 -year-old Connor Currie, died after security incidents outside the Greenvale Hotel on Sunday night. The police said a large group of young person had been waiting to get into a disco at about 21:30 GMT. “No matter how much we screamed and pushed back, there was no fluctuation, ” said eyewitness Eimear Tallon.